Note for softer crust use oil lined bowl for rise since adding oil to dough will soften the final crust. For many they claim this the best pizza ever … so here are there recipes that look good … updates coming soon !!! In bowl mix your water, sugar and yeast and set aside to proof for about 5-10 minutes. Once foamy, add in your salt and butter and stir to combine. 1 cup at a time add in your flour and mix well, pour out onto a flour lined countertop and knead, adding more flour as your go to reduce stickiness. Once all lumps are out and dough is smooth and slightly sticky place in a large bowl sprayed with cooking spray and flip to coat all sides. Cover and place in warm draft free place to rise for about an hour or until double in size. Once risen remove from oven and spray countertop with non-stick cooking spray and turn your dough out. Cut into 6-8 equal sized pieces, pull each of your pieces to about 18-24″ length and flatten with palm of hand. 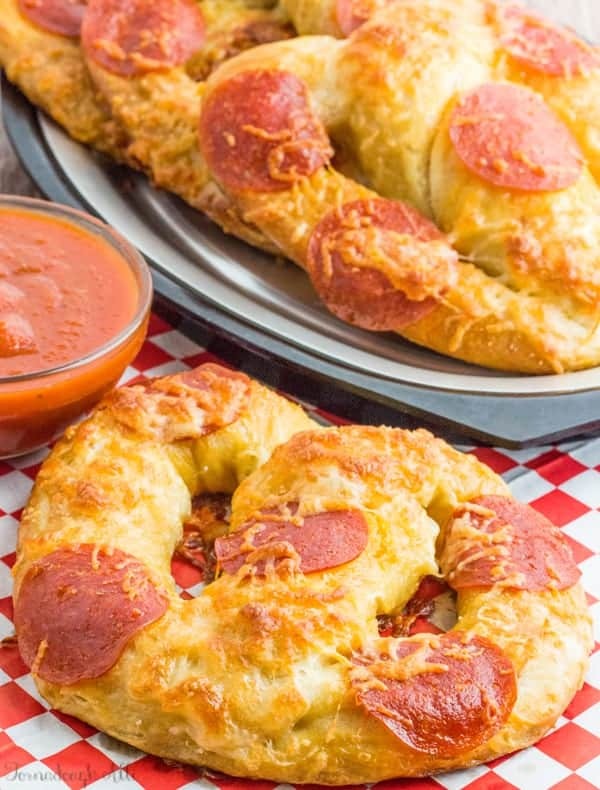 Spread some of your mozzarella cheese down the center or each piece of dough and then pinch edges to close, grab each end and twist into a pretzel shape and slightly flatten, repeat with remaining dough. Meanwhile bring your water and baking powder to a boil, add one pretzel at a time into the water and boil for about 30-60 seconds, remove with slotted spoon and place on baking sheet. Repeat with all remaining pretzels. 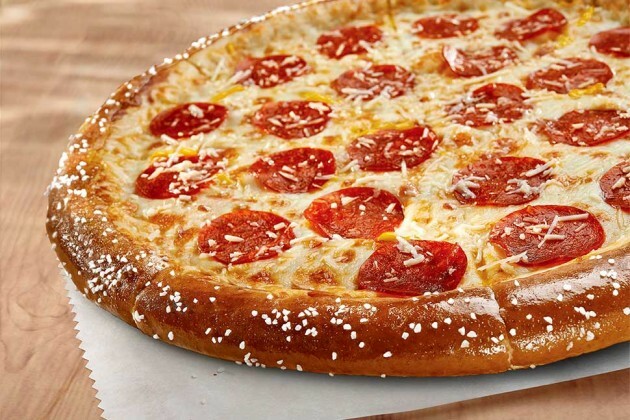 Mix together your egg and 2 Tbs water and brush over the tops of each pretzel, top with pepperoni slices and sprinkle with mozzarella cheese. Bake in oven in batches for about 10 minutes or until cheese is melted. Rob’s Soft Pretzel Recipe In a small cup measure out: 1/2 cup warm water (105 Degrees F) 1 spoonful yeast dry active sprinkle of sugar Stir and let that sit for 5 minutes. It should turn foamy. if it doesn’t try again In another cup measure out: 1/2 C milk warm in microwave for 30 seconds then add: 1 spoonful salt 3 spoonful sugar Stir to combine in a large bowl measure out 3 1/4 cups of flour 1 sp olive oil Add water and yeast mixture and the milk, salt and sugar to the flour mixture. Stir for about a minute with a for until combined. Knead for 7-8 minutes. Cover with oil, and place in a bowl in a warm spot. Cover with plastic wrap, poke 5 or 6 holes in the top and let rise for 1 hour or until doubled in size. Remove from bowl and gently knead for 1 minute Cut dough into 8 equal parts. For smaller pretzels, cut those parts in half again. Roll each part out into a thin rope and set aside. Take ropes and make into pretzel shapes, placing them on the counter. Cover with plastic wrap and let them rise 10 minutes. Take a large, wide pot and fill with 8 cups water, add 1/4 C baking soda and bring to a boil. Place each of the pretzels in the boiling water for 30 seconds, then remove with a slotted spoon, shake off any excess water, and place on a baking sheet covered with parchment paper. (optional, brush lightly with a beaten egg) Sprinkle with coarse kosher or rock salt. Repeat with all pretzels. Bake at 450 for about 8-10 minutes or until just golden brown. Roll out pie crust and lay into a 9-inch pie pan. Combine brown sugar, oats, flour, and salt in a large bowl. Work butter into the mixture with your fingers, breaking up any large pieces, until incorporated completely. Cover and chill for 15 minutes. Place the pan on the foil prepared baking sheet. Bake in the preheated oven until cherries are bubbling and the crust and crumble topping are browned, about 1 hour 15 minutes. Let cool completely.